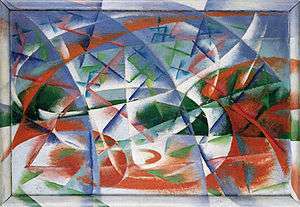 Futurism (Italian: Futurismo) was an artistic and social movement that originated in Italy in the early 20th century. It emphasized speed, technology, youth, and violence, and objects such as the car, the aeroplane, and the industrial city. Although it was largely an Italian phenomenon, there were parallel movements in Russia, England, Belgium and elsewhere. The Futurists practiced in every medium of art including painting, sculpture, ceramics, graphic design, industrial design, interior design, urban design, theatre, film, fashion, textiles, literature, music, architecture, and even gastronomy. 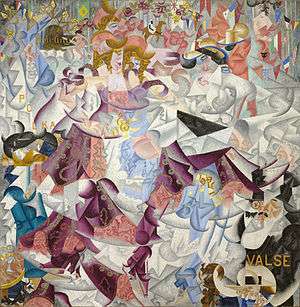 Its key figures were the Italians Filippo Tommaso Marinetti, Umberto Boccioni, Carlo Carrà, Gino Severini, Giacomo Balla, Antonio Sant'Elia, Bruno Munari, Benedetta Cappa and Luigi Russolo, the Russians Natalia Goncharova, Velimir Khlebnikov, Igor Severyanin, David Burliuk, Aleksei Kruchenykh and Vladimir Mayakovsky, the Belgian Jules Schmalzigaug and the Portuguese Almada Negreiros. It glorified modernity and aimed to liberate Italy from the weight of its past. 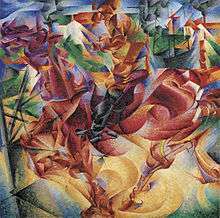 Cubism contributed to the formation of Italian Futurism's artistic style. 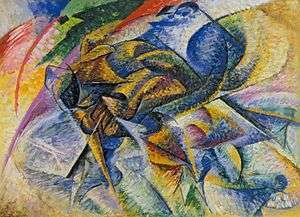 Important Futurist works included Marinetti's Manifesto of Futurism, Boccioni's sculpture Unique Forms of Continuity in Space, and Balla's painting Abstract Speed + Sound (pictured). 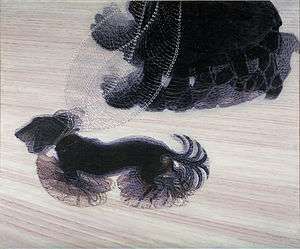 To some extent Futurism influenced the art movements Art Deco, Constructivism, Surrealism, Dada, and to a greater degree Precisionism, Rayonism, and Vorticism. 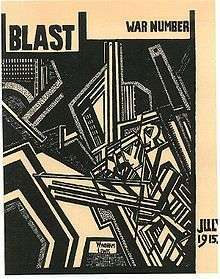 Futurism is an avant-garde movement founded in Milan in 1909 by the Italian poet Filippo Tommaso Marinetti. Marinetti launched the movement in his Futurist Manifesto, which he published for the first time on 5 February 1909 in La gazzetta dell'Emilia, an article then reproduced in the French daily newspaper Le Figaro on Saturday 20 February 1909. 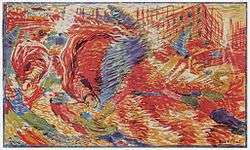 He was soon joined by the painters Umberto Boccioni, Carlo Carrà, Giacomo Balla, Gino Severini and the composer Luigi Russolo. Marinetti expressed a passionate loathing of everything old, especially political and artistic tradition. "We want no part of it, the past", he wrote, "we the young and strong Futurists!" 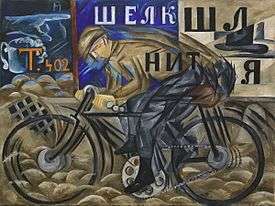 The Futurists admired speed, technology, youth and violence, the car, the airplane and the industrial city, all that represented the technological triumph of humanity over nature, and they were passionate nationalists. They repudiated the cult of the past and all imitation, praised originality, "however daring, however violent", bore proudly "the smear of madness", dismissed art critics as useless, rebelled against harmony and good taste, swept away all the themes and subjects of all previous art, and gloried in science. The movement began to decline after the revolution of 1917. Some Futurists died, others emigrated. Mayakovsky and Malevich became part of the Soviet establishment and the Agitprop movement of the 1920s. Khlebnikov and others were persecuted. Mayakovsky committed suicide on April 14, 1930. Futurist music rejected tradition and introduced experimental sounds inspired by machinery, and would influence several 20th century composers. Futurism was one of several 20th century movements in art music that paid homage to, included or imitated machines. Ferruccio Busoni has been seen as anticipating some Futurist ideas, though he remained wedded to tradition. Russolo's intonarumori influenced Stravinsky, Arthur Honegger, George Antheil, Edgar Varèse, Stockhausen and John Cage. In Pacific 231, Honegger imitated the sound of a steam locomotive. There are also Futurist elements in Prokofiev's The Steel Step and in his Second Symphony. 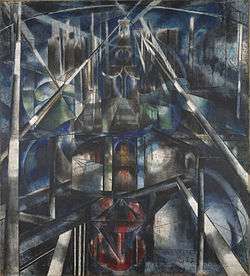 Many Italian Futurists supported Fascism in the hope of modernizing a country divided between the industrialising north and the rural, archaic South. Like the Fascists, the Futurists were Italian nationalists, radicals, admirers of violence, and were opposed to parliamentary democracy. Marinetti founded the Futurist Political Party (Partito Politico Futurista) in early 1918, which was absorbed into Benito Mussolini's Fasci di combattimento in 1919, making Marinetti one of the first members of the National Fascist Party. He opposed Fascism's later exaltation of existing institutions, calling them "reactionary", and walked out of the 1920 Fascist party congress in disgust, withdrawing from politics for three years; but he supported Italian Fascism until his death in 1944. The Futurists' association with Fascism after its triumph in 1922 brought them official acceptance in Italy and the ability to carry out important work, especially in architecture. 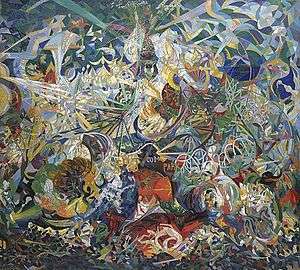 After the Second World War, many Futurist artists had difficulty in their careers because of their association with a defeated and discredited regime. Although Futurism became identified with Fascism, it had leftist and anti-Fascist supporters. 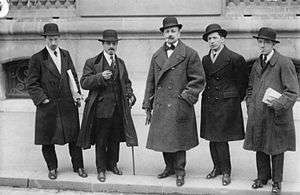 They tended to oppose Marinetti's artistic and political direction of the movement, and in 1924 the socialists, communists and anarchists walked out of the Milan Futurist Congress. The anti-Fascist voices in Futurism were not completely silenced until the annexation of Abyssinia and the Italo-German Pact of Steel in 1939. This association of Fascists, socialists and anarchists in the Futurist movement, which may seem odd today, can be understood in terms of the influence of Georges Sorel, whose ideas about the regenerative effect of political violence had adherents right across the political spectrum. Nonetheless the ideals of Futurism remain as significant components of modern Western culture; the emphasis on youth, speed, power and technology finding expression in much of modern commercial cinema and culture. Ridley Scott consciously evoked the designs of Sant'Elia in Blade Runner. Echoes of Marinetti's thought, especially his "dreamt-of metallization of the human body", are still strongly prevalent in Japanese culture, and surface in manga/anime and the works of artists such as Shinya Tsukamoto, director of the "Tetsuo" (lit. "Ironman") films. Futurism has produced several reactions, including the literary genre of cyberpunk—in which technology was often treated with a critical eye—whilst artists who came to prominence during the first flush of the Internet, such as Stelarc and Mariko Mori, produce work which comments on Futurist ideals. 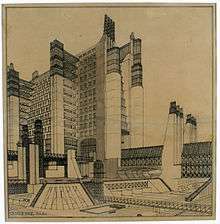 and the art and architecture movement Neo-Futurism in which technology is considered a driver to a better quality of life and sustainability values. In 2009, Italian director Marco Bellocchio included Futurist art in his feature film "Vincere". 1 2 The 20th-Century art book. (Reprinted. ed.). dsdLondon: Phaidon Press. 2001. ISBN 0714835420. ↑ Arnason; Harvard, H.; Mansfield, Elizabeth (December 2012). History of Modern Art: Painting, Sculpture, Architecture, Photography (Seventh ed.). Pearson. p. 189. ISBN 0205259472. 1 2 "Technical Manifesto of Futurist Painting". Unknown.nu. Retrieved 2011-06-11. 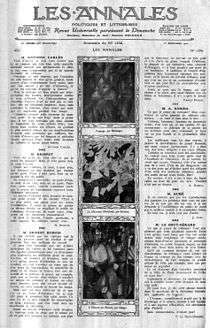 ↑ For detailed discussions of Boccioni's debt to Bergson, see Petrie, Brian, "Boccioni and Bergson", The Burlington Magazine, Vol. 116, No.852, March 1974, pp.140-147, and Antliff, Mark "The Fourth Dimension and Futurism: A Politicized Space", The Art Bulletin, December 2000, pp.720-733. 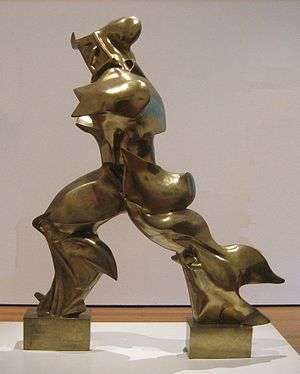 ↑ "Technical Manifesto of Futurist Sculpture". Unknown.nu. 1910-04-11. Retrieved 2011-06-11. ↑ "The Founding and Manifesto of Futurism". Unknown.nu. Retrieved 2011-06-11. ↑ Daly, Selena (2013-11-01). "'The Futurist mountains': Filippo Tommaso Marinetti's experiences of mountain combat in the First World War". Modern Italy. 18 (4): 323–338. doi:10.1080/13532944.2013.806289. ISSN 1353-2944. ↑ Daly, Selena. "Futurist War Noises: Confronting and Coping with the First World War". California Italian Studies. Retrieved 2015-09-13. ↑ Russolo, Luigi (2004-02-22). "The Art of Noises on Theremin Vox". Thereminvox.com. Retrieved 2011-06-11. ↑ The Art of Noises Archived September 29, 2007, at the Wayback Machine. ↑ "Daniele Lombardi in Futurism and Musical Notes". Ubu.com. Retrieved 2011-06-11. ↑ "Pauline Kael: Reviews A-Z". Web.archive.org. 2009-10-26. Retrieved 2011-06-11. ↑ "Osborn, Bob, Tullio Crali: the Ultimate Futurist Aeropainter". Simultaneita.net. Archived from the original on 2010-02-07. Retrieved 2011-06-11. ↑ Potter, Janet (16 December 2013). "Too Much Light at 25: An oral history". Reader. Retrieved 4 January 2014. ↑ "MoMA | Finding The Robot". www.moma.org. Retrieved 2015-09-13.